You can get a pretty darn good sound bar these days for about $100, and it’ll give the audio quality on your TV a big upgrade. Since sound bars are so compact and easy, many people go that route. What you might not know, however, is that you can spend the same amount of money or even less and get a full surround sound system. 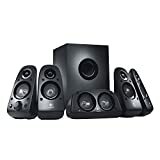 Check out the Logitech Z506 6-Piece 5.1 Channel Surround Sound Speaker System. It’s just $50 right now on Amazon for a refurbished system that’s certified and guaranteed, and you’ll get an audio experience that can never be replicated with a sound bar.